NANA and GRAN showing off at "In the Pink", Ngongotaha, 2010. Breast cancer can be inter-generational. Talk with family about what female relations lived and died with. and from a floral flannelette sheet, once used by her mother. 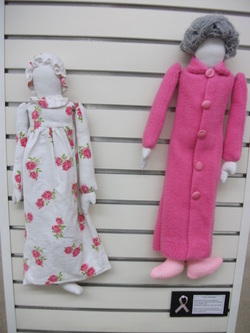 They are adapted from a pattern by elinor peace bailey.